The Bonavita Wide Base Immersion Dripper is a porcelain filter that allows coffee to steep for several minutes before filtering it into your cup or carafe. Thus it combines the best of pour over with extraction closer in flavor to French Press. The dripper has a 16 ounce capacity but less coffee can be brewed if desired. To make a full filter's worth begin by moving the base lever to the closed position and placing the Immersion Dripper onto a sufficiently large mug or carafe. Put in a #4 paper filter and rinse it with hot top water to remove any paper taste. Weigh 30 grams of somewhat coarse grind coffee, about 4 tablespoons if you don't have a scale, and place it into the filter. Pour nearly boiling water over the grounds and cover with the supplied lid to retain heat. You can lightly stir the grounds after a minute. After an additional couple of minutes, 3 to 4 minutes in total, carefully move the lever to the open position and the filtered coffee will drip through. 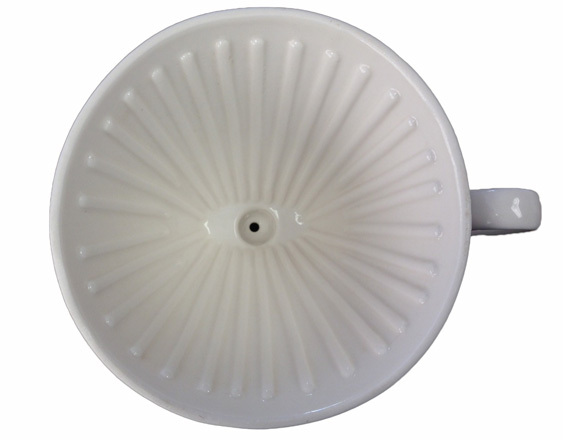 This dripper is very made and the fact that it is porcelain is a big aid to heat retention as well as making for a substantial feel. Five #4 natural paper filters are included. The whole device is dishwasher safe and the Immersion Dripper can alternately be use to brew tea, adding to its versatility.